This particular choker is made up of a series of rectangular panels linked together by vertical rows of diamonds. Each "panel" of the Love Trophy necklace features a specific set of symbolic design elements; you can see one panel head-on in the detail of the photograph above. The center of the panels features an "amatory trophy" (hence the name of the piece): a burning torch and a quiver of arrows crossed with an archer's bow, with clear references to Cupid, the god of love. This "love trophy" is surrounded by a wreath of laurel and suspended from a diamond ribbon tied in a bow. 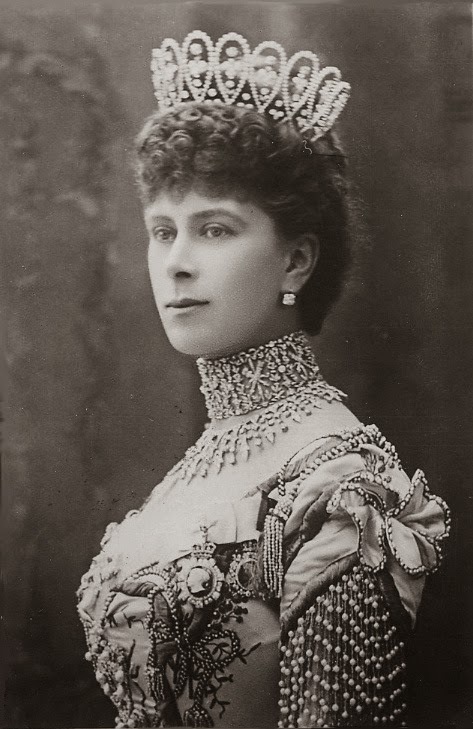 It's sort of a cliche these days to imagine how heirloom royal jewelry would look on the most popular young royal lady out there, the current Duchess of Cambridge, but I really think she might be the one most likely to pull this piece off. 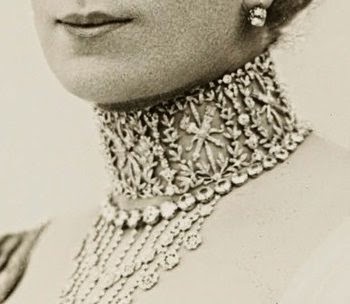 She's tall, she has a long neck, and she favors unfussy fashions that would not compete for the spotlight with an elaborate necklace like this. The Queen has shown that she's willing to let her granddaughter-in-law wear important pieces of royal jewelry out and about (think of her appearances in the Papyrus Tiara and the Nizam of Hyderabad Necklace). Perhaps the Love Trophy Collar might reappear someday soon on her, too? 1. Photograph in the public domain due to age; source here. The web source dates the image to 1902; however, Hugh Roberts dates a photograph from the same sitting to 1905 in The Queen's Diamonds. 2. Cropped version of a photograph in the public domain due to age; source here.